Display Line Number : This option sets whether to display or not the sequence number of each Grid row. Display Titles : This option sets if the column title (column label) will be displayed or not. Line break in title : This option sets if the column line title will break or not. Margins : Sets the application margins in pixels (up, down, right and left). Alignment : Allows you to set the fields alignment for when the Grid orientation is set as Vertical or Slide. 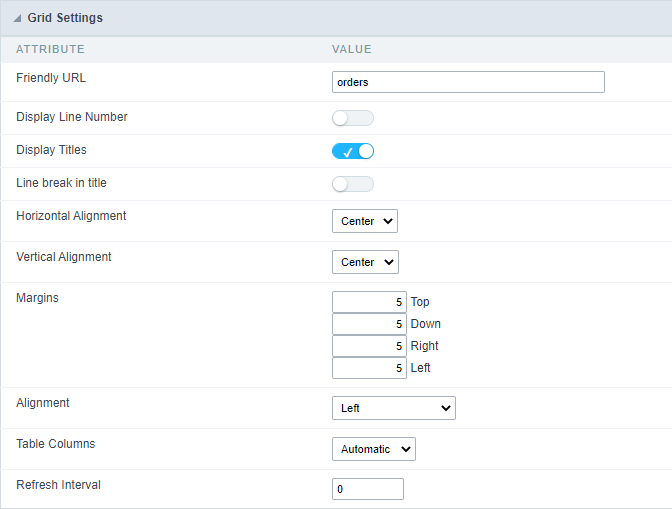 Table Columns : Sets the column widths type: Provides (It will assume the informed width values at field level in the configuration of the visualization), Calculated (Calculate size according to type and the field size) and Automatic (The alignment will be according to the browser criteria). Refresh Interval : Allows you to set a reload interval for the page, in seconds. When is set as zero, there will be no page reload.